Expressive language is what you are able to say and how you verbally communicate with others. This is contrasted with receptive language which is what you understand. There is a whole progression of milestones that children are expected to meet at different times in their young lives. So what happens when your child isn't meeting all of their speech milestones? You sign them up for speech of course! Below are a couple tips and ideas for things you can do to help build your child's expressive language. When you narrate, you are naming everything you see and everything you are doing. You label what you see your child doing. You talk about colors, shapes, sizes, number of objects, etc. This helps build your child's receptive language and also their vocabulary. I am a HUGE advocate of not watering down anything. I don't do it with my students and don't do it with my son either. I use large words and tell my son when something has different names or when words have different meanings. All of these things are what make the English language so difficult to learn, so why not start when they are babies and toddlers. Take it a step farther and start asking your child to echo you or imitate what you are saying. They start to sound like little parrots, but they need the practice. Once they are imitating you well, start asking them what the names are of different things you see or read about. I knew repetition was important when teaching Kindergarten, but holy smokes, I never realized just how important it was in their speech development. Finding repetitive activities to help them practice their new found language is essential. One effective way of doing this is through play. 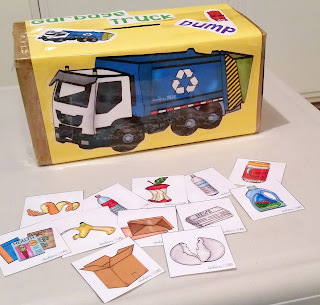 I use things that are of interest to my son and practice combining a verb and a noun. For example, my son is obsessed with balls...he can name a basketball, baseball, soccer ball, so whenever he is shooting a basketball into his Little Tikes hoop, I use that as a teachable moment. When giving him the ball, I tell him "catch ball" or "shoot ball" and ask him to echo that as he is doing the action. He will do this for an extended period of time, so it gives him multiple opportunities to practice combining words while being distracted playing basketball. Similarly, my son loves garbage trucks and will run from window to window in our house to watch the truck go down our alley. I created a resource that you could use if your child is also in the phase of loving all things truck related!